By downloading the PlayStation App from the App Store or Google Play, you can connect your PlayStation 4 system to your smartphone or tablet. Here’s a guide on how to connect your PS4 to the PlayStation application. Before you get started, make sure you connect your smartphone and your PS4 system to the same network. From your PS4 system, select Settings, PlayStation App Connection Settings, and Add device. Once you select your network, a number will appear on your TV screen. Enter the number into your smartphone or tablet, select Register, and your device will be connected to your PS4. Now that your device is connected to your PS4, you can manage your game downloads, check out the latest games, and redeem codes using your phone’s camera or by entering the code in manually. Register up to 16 devices on a single PS4 system. See what games your friends are playing, compare trophies, and view your profile. Access PlayStation guides, manuals, and the PlayStation.blog. A Sony Entertainment Network account and PS4™ system are required to use all of the features on the PlayStation application. Use your iOS or Android device as an on-screen keyboard for your PS4 system. 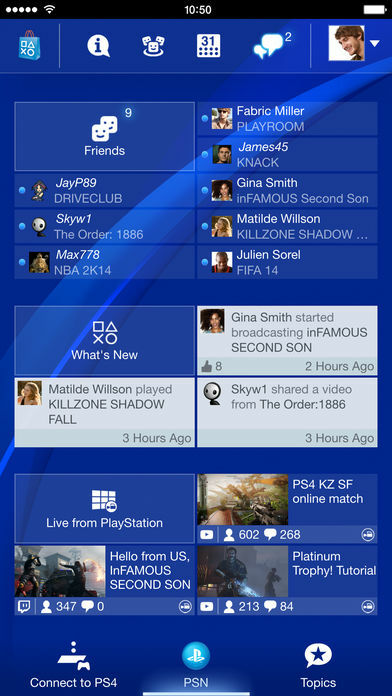 The PlayStation app is available to download from the App Store and Google Play.